A steak (from Old Norse steik, "roast") is a cut of meat (usually beef). Most steaks are cut perpendicular to the muscle fibres, improving the perceived tenderness of the meat. 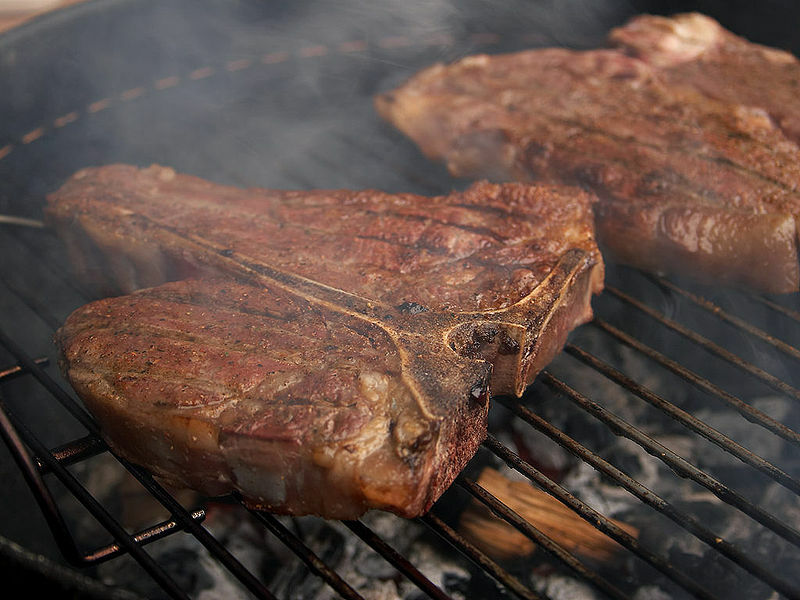 In North America, steaks are typically served grilled, though they are also often pan-fried. Left: Porterhouse steak on a grill. The more tender cuts from the loin and rib are cooked quickly, using dry heat, and served whole. Less tender cuts from the chuck or round are cooked with moist heat or are mechanically tenderized. In the United States a typical steak dinner consists of a steak, with a starchy side dish, usually baked potatoes, but occasionally another potato dish, rice, pasta, or beans. A small serving of cooked vegetables accompanies the meat and side, with green beans, creamed spinach, asparagus, tomatoes, mushrooms, peas and onion rings being popular. A well-known accompaniment to steak is shrimp or a cooked lobster tail, a combination often called "surf and turf" or "reef and beef" and "pier and steer". Tenderized round or sirloin steaks, breaded, and pan-fried or deep-fried, are called chicken fried or country fried steaks, respectively. Thinly sliced ribeye or other tender cuts, cooked on a hot griddle and shredded slightly, and served on Italian style rolls are called Philly steaks, named after Philadelphia, the city in which they became famous. In France, steak is usually served with French fried potatoes also known as "frites", and the combination is known as "steak-frites". Vegetables are not normally served with steak in this manner, but a green salad may follow or (more commonly) be served at the same time. This is also the case in the United Kingdom. In Australia, New Zealand, Canada, the United Kingdom, Ireland, United States and South Africa, a restaurant that specializes in beef steaks can be known as a steakhouse. Special steak knives are provided along with steak. Steak knives are sharper than most table knives and are usually serrated. Prepared condiments known as steak sauces are generally on the table in steakhouses. Raw - Uncooked. Used in dishes like steak tartare, Carpaccio, Gored gored (a raw beef dish eaten in Eritrea and Ethiopia), and Kitfo (a traditional dish, found in Ethiopian cuisine, that consists of minced raw beef). Blue rare or very rare - (46°C [115°F] core temperature) Cooked very quickly; the outside is seared, but the inside is usually cool and barely cooked. The steak will be red on the inside and barely warmed. Sometimes asked for as "blood rare" or "bloody as hell". In the United States this is also sometimes referred to as 'Black and Blue' or 'Pittsburgh Rare'. Rare - (52°C [125°F] core temperature) The outside is gray-brown, and the middle of the steak is red and slightly warm. Medium rare - (55°C [130°F] core temperature) The steak will have a fully red, warm center. Unless specified otherwise, upscale steakhouse will generally cook to at least this level. Medium - (60°C [140°F] core temperature) The middle of the steak is hot and red with pink surrounding the center. The outside is gray-brown. Well done - (71°C [160°F] and above core temperature) The meat is gray-brown throughout and slightly charred. Overcook - (much more than 71°C [160°F] core temperature) The meat is dark throughout and slightly bitter.